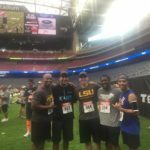 alliantgroup’s 5k season kicked off with over 100 runners completing the Houston Texans Running of the Bulls 5k this Sunday! 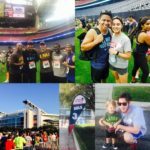 This yearly tradition has become a family favorite as runners, family, and friends make their way around NRG Park to cross the finish line inside the Texan’s iconic stadium. What better way to end a fantastic event, than to hang out on the field at the 50 yard line with Torro and the Texans Cheerleaders! Check out some of our favorite moments from this year’s 5k race!